Sundays – lunch for church members and visitors served prior to church service (one Sunday per quarter, as announced). Our hot meal program is a collaboration with the Hunger Network of Cleveland and the Greater Cleveland Food Bank. The Clothing Store opens after lunch on Wednesdays. Clothing is available for men, women and children. There is a minimal cost per item. A voucher program is available for those without financial resources. No one is turned away due to inability to pay. Medical Services are available to those with minimal or no insurance. All services are free of charge. Eye clinic is held twice a month on Wednesday afternoons to assess eye health (not an exam for prescription lenses, although reading glasses are available for a minimal cost). Services are provided by appointment only. See the medical services page for more specific information. Pregnancy Testing and Counseling Services are available to potential or mothers with infant 6 months and younger. The Learn & Earn program helps pregnant mothers learn proper pre-natal and infant care through one-on-one and video instruction. Incentives available in the Care Closet, packed with brand new baby items! Pregnancy Advisor Training: Calling a few good women! A training series is offered to equip you to make a difference in another woman’s life. Please contact Sherri Vanek, Clinical Coordinator, for information. (216) 881-8816 or e-mail: svanek@freehope.org. Parenting classes (Raising Kingdom Kids) Coming Soon! Learn what the Bible says about parenting your children God’s way. This will be offered in a 12-session course (completed over 12 weeks) using the Raising Kingdom Kids curriculum by Tony Evans. This is a general course (not covering any specific ages). Held in small group format. If interested, contact Mike Vanek for details. The first class will be offered in the fall of 2019. There is a short video introduction to the series on the home page (see the link for Raising Kingdom Kids). Learn basic keyboard and computer skills in the Bridge of Faith Learning Center. Classes are now only offered as part of the Jobs for Life program (see below). Call (216) 881-8816 for registration information. The Jobs for Life program (Jobs for Life website) is an employment readiness training program that began in April, 2011. It is a small group format. The program consists of 13 weeks of formal, classroom training and 26 weeks of a volunteer internship and job seeking activity. The program runs on Wednesdays and Thursdays. The goal is to prepare individuals for paid employment. For a short video on the Jobs for Life program, see the link on the home page. An application and interview are required. Contact Mike Vanek for more information on requirements and scheduling. The Life Transformation Group is a Bible-based class that teaches students the Biblical solution to addictive behavior of any kind. Class runs for 12 weeks. Books and all materials are provided. Next series will begin on March 7, 2019. The class is designed for those with past or active addictions or for those interested in learning what the Bible says about addictions. The curriculum we use is “The Heart of Addiction” by Dr. Mark Shaw (for a short video on the class philosophy, see the link on the home page). For further information, or to register, contact Mike Vanek at (216) 881-8816. A Men’s Bible Study meets every Wednesday morning from 10:00 – 10:45 a.m.
Men’s Bible Study & Fellowship is a men’s group that meets every Saturday morning from 10:00 a.m. – 12:00 p.m. It is offered for men who wish to support each other, improve the spiritual quality of their daily lives, and nurture good relationships with family and friends. In addition to Bible study, the group includes activities, fellowship, and service projects. A Women’s Bible Study meets every Wednesday morning from 10:00 – 10:45 a.m.
Ladies’ Bible Study & Lunch, led by Laura Niemeyer, meets every Thursday from 10:00 a.m. – 2:00 p.m. Lunch is provided before the Bible study. This is a time to study God’s Word, fellowship, and make friends! Pregnancy Services are available to women who qualify. See the Pregnancy Services page (link at the left) for additional information. Bible Seekers Club and Bible Teens Club are programs designed just for children and youth. Both meet every Saturday (throughout the school year) from 1:00 – 3:30 p.m. Children and youth who attend will hear a Bible lesson, sing, and play games. 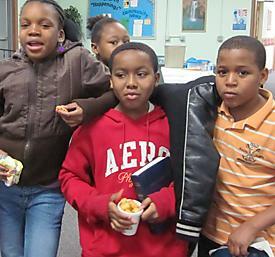 A hot meal is provided to each child and youth during club. Club does not meet during the summer months. Vacation Bible School (VBS) occurs during the summer months. Games, Bible stories, crafts, and snacks are included in the program. Themes vary each summer. Summer Camp at Skyview Ranch in Ohio is available for one week each summer. Camp scholarships are provided each year for a select number of youth. For details, call Jackie at (216) 881-8816. The Church Service begins at 2:30 p.m. every Sunday. Everyone is welcome! Faith Baptist Community Church is a great place to worship the Lord and to hear God’s Word preached. Sunday School classes are available for all ages following the worship service. Sunday School classes begin at 3:45 p.m. Prayer Meeting takes place each Wednesday morning from 10:45 – 11:30 a.m. (immediately following the Bible Studies). Prayer meeting includes a short devotional and a time of sharing prayer requests and praying. Join us for this special time every Wednesday morning. Discipleship Services are provided for those interested in one-on-one study/guidance. Activities include Biblical counseling and Bible study. Discipleship services are available on a scheduled basis. For more information or to schedule, call Pastor Michael Vanek: (216) 881-8816. If you are looking for another service that we do not provide (such as crisis services, a food pantry, shelter, etc. ), Relink is a free referral service that connects people with the services they need that are accessible to them. You can either call or come into our office and we will provide you with specific referral information. Or, you can access Relink on the web.